Tiger Album of Modern Sportscars. Homepage. This page: A children's sticker book from the early 1960s featuring classic sportscars. Tiger Album of Modern Sports Cars of the World. As a child I remember collecting bubble gum cards. This album though, published alongside the popular Tiger children's comic, pre-dates me somewhat by dating to 1961/1962. 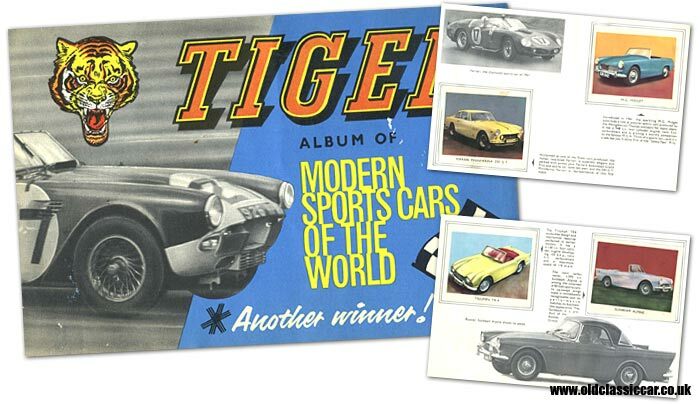 Within its pages are descriptions of the popular sportscars of the early 1960s, alongside which are stickers featuring illustrations of all the cars. The cover features a photograph of the rare Triumph TRS sportscar, registration 926 HP, one of four fibreglass-bodied cars built to compete at Le Mans in 1960 and 1961. Interspersed between the stickers in the album are images of motor racing, the first pages for instance feature scenes at Le Mans, with similar photographs taken at Goodwood, along with a few images of drivers and other cars, appearing elsewhere. Stirling Moss is shown clutching a cake, with seven candles, following his seventh victory in the RAC Tourist Trophy at Goodwood. "Great Britain has always been in the vanguard of sports car development and the Austin Motor Company has, in recent years, collaborated with Donald Healey to produce sleek and powerful vehicles. Typical is this 120mph Austin Healey 3000." "The USA is renowned for her large, powerful cars and her best-known sports model - the Chevrolet Corvette - is a fast and impressive-looking two-seater. It has a V-eight engine, is made by General Motors and its top speed is more than 135mph." "Introduced in 1961, the sparkling MG Midget continues a line of popular sports cars produced by the Abingdon-on-Thames company for many years. It has a 948cc four cylinder engine, twin SU carburetters and is proving a worthy companion to the famous MGA. Think of a sports car - and it's a safe bet that you'll think first of the "Safety Fast" MG."
"Another great car from Italy: a Zagato-bodied Lancia. Superbly elegant with fantastic reserves of power from a six cylinder, 2458cc engine. This top-quality motor-car typifies the fine craftsmanship of Italian body-builders and motor engineers." The rear cover completes this sticker album by showing a line of drivers sprinting to their steeds at the start of the 1961 Tourist Trophy at Goodwood. Moss would go on to win this race in a Ferrari 250GT swb. More period items relating to old vehicles can be found in the Motoring Collectables section of oldclassiccar.co.uk. 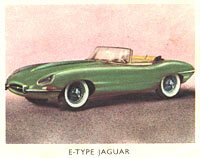 Included within the section looking at children's book covers with a motoring theme to them, is one from 1958 for the Tiger Annual.